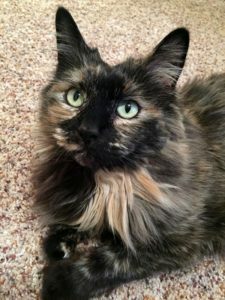 Sasha – Female DLH Tortie 7 Years Front Declaw – Foreclosed Upon Pets, Inc.
My name is Sasha and I am a seven year old declawed girl who wants to be your friend. I love to be brushed and I have a beautiful coat. I like to sit by the sink and watch you get ready for work and be with you when you watch TV and of course sleep with you at night. I would do best in an adult only home as I don’t have the time or patience with small children or other cats. I’ve been spoiled by my previous human who was my Prince Charming. He is sad and hopes my new Prince or Princess Charming will come rescue me. I am staying with my foster parents but I really want my forever human please. My adopt fee is $80.00.